If you break the screen of the Galaxy S7 edge, it will cost you the whopping $270 plus at least a week turnaround time to get it replaced, and the only display provider is Samsung. If that is not a rallying cry to summon your inner grace each time you handle this phone, or keep it in bubble wrap, we don't know what would be. Granted, you can always put an armored case around this pretty puppy, plus a layer of screen protection, but, let's face it, it won't look as good, plus the edge screen might not work as well. What if you are a phone nudist, and don't place any protection so as not to cover the shiny surface, until just that one night out on the town comes, or a natural born klutz, and constantly drop your handsets? Well, then what's left for you is to either pony up a Benjamin (or two or three), if you shatter the screen or cause any other damage, or to try and insure the gear from the get-go, so the sting on your finances is not as piercing. Which insurance to pick, though, and is it worth it at all? Well, we've compared a few popular options below to help you choose if you decide to go the insurance route with deductibles for expensive phones like the Galaxy S7 edge or the iPhone 6s; at $270 to replace the edge display, and $150 to swap the 3D Touch panel without insurance, they are the ones most likely to benefit from it. There are carrier (mostly handled by dedicated companies like Assurant or Asurion), manufacturer and third-party options, so take a peak, and tell us your verdict on whether this kind of protection is worth the investment for you. $216 ($9 a month) $199 Loss, theft, accidental damage, out-of-warrranty malfunction. Two claims within any consecutive 12 months. $168 ($7 a month) $199 (declining to $149 after 6 months since last claim, and to $99 after a year) Loss, theft, accidental damage, out-of-warrranty malfunction. $240 ($10 a month) $175 Loss, theft, accidental damage, out-of-warrranty malfunction. $264 ($11 a month) $200 Loss, theft, damage and malfunction coverage. 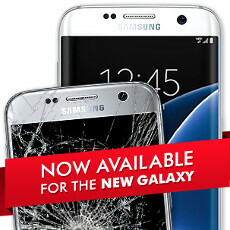 Your first two repair/exchange claims are included at no additional charge. After these first two claims a $25 service fee applies for any future repair/exchange within a 12-month period. $129 $99 Repair or accidental damage replacement, both parts and labor, from Apple-authorized technicians. Coverage will expire when Apple has provided to you two service events. No loss or theft coverage. $129 $79 Accidental damage, and mechanical or electrical breakdowns after the manufacturer's warranty expires. Up to 2 replacements in a 12 month period for accidental damage claims. No loss or theft coverage. $119 ($5 a month) $99 Continuous accident and malfunction coverage for any working phone, old or new. Up to 4 claims, the value of your cover is limited to the original purchase price of your item. Convenient service at any local repair shop, but no loss or theft protection. Looking at the table above, it's easy to deduce that phone insurance doesn't come cheap, but if you are paying in monthly fees of five or ten bucks, it is bearable. Is it worth it, though? As with most comparisons, there is no straight answer that would be valid for all situations, so let's look at a few examples with the most typical accidental damage - a broken screen. The best pro-insurance case is if you, say, own the Galaxy S7 edge, and sign up for the cheapest option to cover it, which just happens to be the Samsung Protection Plus guarantee. With insurance, a broken panel will cost you $210 in payment and deductible, instead of $270, so in that case you are better off ponying up to insure the S7 edge. Ditto for phones like the Note 5 or the S7, whose AMOLED panels hover around or above the $200 mark, too. If you own, say, an iPhone, even if it is the 6s Plus, whose 3D Touch panel costs $149 to replace outright, AppleCare will net you $220 for the same with the deductible. At first blush, this doesn't seem like a bargain, but if you manage to inflict, say, accidental permanent water damage to the handset, that calculation turns on its head. Moreover, AppleCare offers a very quick repair or replacement service in any Apple shop, as long as you make an appointment online beforehand, so you won't have to stay parted with your iPhone for too long. If you lose those phones, or they get stolen, however, you are out of luck with no-loss plans like Protection+, AppleCare, or SquareTrade. To cover those eventualities, you might want to dole out for a carrier insurance plan. It costs much more than the other options ($370 - $470 for one accident in the span of two years), but you pay in $7-$11 monthly installments, and the worst-case contingency covered in those plans is that your top-shelf phone gets lost or stolen. Given that those puppies cost north of $650, it's still worth it when you draw the line. Of course, these pro-insurance examples are somewhat extreme, as the screen replacement for most phones is not as expensive, or you might be of the prudent type who's never got their phone lost or snatched. In that case, you could soldier on without insurance. The more you drop, lose, or are in any other way careless with your handset, however, the more any type of insurance will pay off over the span of the typical protection plan. Pick your poison. Same here, I have never had to use my AT&T insurance , but I keep it on all the smartphones we have just in case. I quit paying insurance for my handsets in 2014 when I got the M8 because the prices went up every year. I've never lost, broken, or had my device stolen so I thought it best to quit paying insure. I'm a glass screen protector and case kind of guy. Just risk it, I have not broken a phone in the last 4 years. But I can't tell the future. Ok guys i have a question and hope one of you can help me: I recently purchase the s7 edge. Slim cases and tempered glass are so rare to find fir this device and i really want to maintain its beauty. If i buy protection +,will it cover things such as scratches, dents,crack glass? I'd rather chance it as I usually don't break phones and the cost to pay for the insurance and deductible is close enough to the price of the screen. I know how to fix phones anyways so that is my situation. Insurance in general isn't worth it unless you are careless or clumsy with your belongings. My note 5 went in to reclining chair on day 36 of purchase. Came out bent and never turned back on. Got new one next day by paying $80 deducible. They gave me 64gb, I had 32. Also you can get battery replaced (another phone off course) once. So pretty much worth it. When it comes to customer cares. No company even comes close to Apple. Even if you don't have Apple care. As long as your warranty is still covered, Apple will provide extra effort other than others. That's a fact. That is one pricey insurance, but its for a peace of mind if things could get worse. I am usually good with a $10 case. The second I take the freaking case off I mess up the phone. Like the entire time with a case on it it's golden............take it off for a second and it's like the floor is a magnet for my phone. Damn you gravity. How can you list phone insurance and not list Nexus Protect? because if its not samsung or apple, PA doesnt care. I had customers that were such clutzes or so impossibly dependant on their phones I recommended stacked coverage. Asurion plus Applecare, for example. I've had one SmartPhone stolen (my first one, an iPhone 3Gs), but never have I had any broken screen gadget. I'll ALWAYS put a sleek Carbon Fiber case on my SmartPhone, looks premium and stays protects. Let's say I have Verizon's insurance plan for $9 per month and the $199 deductible every time I make a claim. Verizon's insurance covers loss and theft. So let's say when I want to upgrade my phone after 1 year, I claim that I lost it and pay the $199 so they can give me a new phone. That means I have 2 phones now and have paid $307 over the year in insurance. Well I can sell both 1 year old phones for over $307. Am I missing anything? Sounds like insurance fraud to me, along with one or two bad ESN devices (depending on how your comment is read). Insurance fraud can either be a misdemeanor or felony & quite possibly a punishable crime, but if being a thief sounds like a good idea to you.. Also verizon might catch on to you & then you could find yourself on the other side of their lawyers.